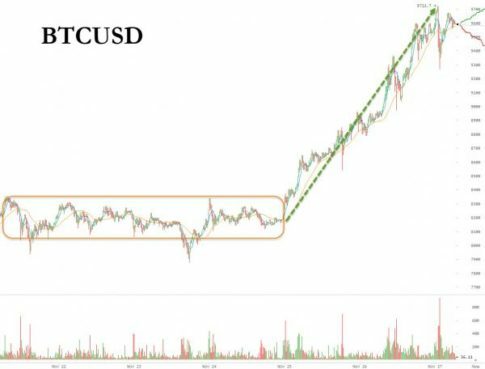 The price of the largest cryptocurrency soared 16% over the weekend, bursting through $8,000 and $9,000 at a record pace and nearing the Maginot Line so many predicted at $10,000. The 16% surge is, however, only the 4th biggest jump this year as Bitcoin is up 950% year-to-date. “The Coinbase data is evidence that adoption is not slowing down,” Alistair Milne, the Monaco-based manager of the Altana Digital Currency Fund, told Reuters. Furthermore, “promises of bitcoin futures opening the door to institutional money are supercharging the price,” said Charles Hayter, founder of cryptocurrency data analysis website Cryptocompare. Notably, as Bitcoin tops $160 billion, the market cap of all cryptocurrencies topped $300 billion for the first time – making their estimated market value greater than that of Wal-Mart. 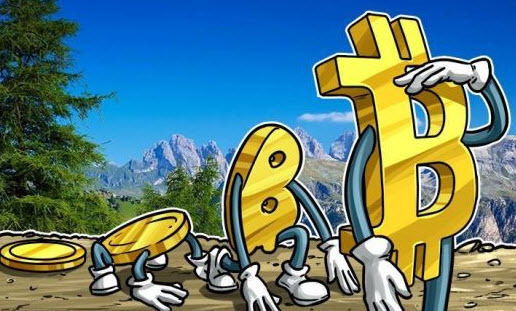 However, as Reuters reports, the staggering price increases seen in the crypto-market have led to multiple warnings from central bankers, investment bankers and other investors that it has reached bubble territory. “Regulators know the rewards of cryptocurrency and blockchain could be huge but (they) have more than one eye on the catastrophic ramifications if good governance, stability and control are not preserved,” said David Futter, a fintech partner at law firm Ashurst, in London. Most critically though it is the central bankers that matter and they appear confused by crytpocurrencies’ surge – some unable to sleep due to the disruptive change looming and others dismissive of the ‘bubble’. As Reuters reports, it keeps them awake at night because these private currencies threaten their control of the banking system and money supply, which could undermine the monetary policies they use to manage inflation. “Bitcoin is a sort of tulip,” ECB Vice President Vitor Constancio said in September, comparing it to the Dutch 17th century trading bubble. “they should not seek… to promote the use of virtual currencies” because these could “in principle affect the central banks’ control over the supply of money” and inflation. Yet Japan in April recognized bitcoin as legal tender and approved several companies as operators of cryptocurrency exchanges but required them register with the government. Finally, in an effort to counter the private decentralized cryptocurrencies, some central banks such as Sweden’s Riksbank and the Bank of England are also looking at the merits of introducing their own digital currency. $BTC a hair under $10k and $ETH a hair under $500. It’s official: if someone calls crypto a scam or a bubble, you can literally slap them in the face. #Russia: The first round on the Russian toboggan run is opened. This will be an interesting aspect. Anonimity with the Bankster based world Blockchain is a No-No! But will Bitcoin be outside that?